Catching up on some earthquake reports on a Friday night. This earthquake happened on 2017.01.10 in a region to the west of the Molluca Strait. I have reported on Molucca Strait earthquakes several times before as this is a very seismically active region. To the north and east of the Molucca Strait is a subduction zone, where the Philippine Sea plate (PSP) subducts westward beneath the Sunda plate (SP), forming the Philippine Trench. This M 7.3 earthquake is within the PSP at a depth of about 600 km. Here is the USGS web page for this earthquake. The Molucca Strait trends north-south due to the east and west vergent, ~north-south striking, thrust faults here. Here are some earthquakes that have happened in the Molucca Strait region. These are #EarthquakeReports that I prepared at the time. This region has earthquakes like these pretty regularly (monthly). Below are some USGS examples from the last month. The PSP subducts westward and has earthquakes deeper than 600 km. These are not subduction zone earthquakes (deeper than 40-50 km max), but are related to deformation within the downgoing plate. (my fingers typed plage instead of plate, which leads me to remember the disease “the plage” in Star Trek Voyager. digression aside.). This M 7.3 earthquake appears to be an earthquake like this, within the PSP that is internally deforming. I placed a moment tensor / focal mechanism legend on the poster. There is more material from the USGS web sites about moment tensors and focal mechanisms (the beach ball symbols). Both moment tensors and focal mechanisms are solutions to seismologic data that reveal two possible interpretations for fault orientation and sense of motion. One must use other information, like the regional tectonics, to interpret which of the two possibilities is more likely. The moment tensor shows east-west extension, perpendicular to the convergence at this plate boundary. This earthquake is the result of extension in the PSP. I include the slab contours plotted (Hayes et al., 2012), which are contours that represent the depth to the subduction zone fault. These are mostly based upon seismicity. The depths of the earthquakes have considerable error and do not all occur along the subduction zone faults, so these slab contours are simply the best estimate for the location of the fault. Today’s M 7.2 earthquake is not directly related to the subduction zones in this region (it is genetically related to a spreading ridge), but they do play an important role in the region. I include some inset figures in the poster below. In the upper right corner I include a map showing the seismicity and tectonic plate boundary faults for this region (Smoczyk et al., 2013). Earthquakes are plotted with color representing depth and diameter representing magnitude (see legend). 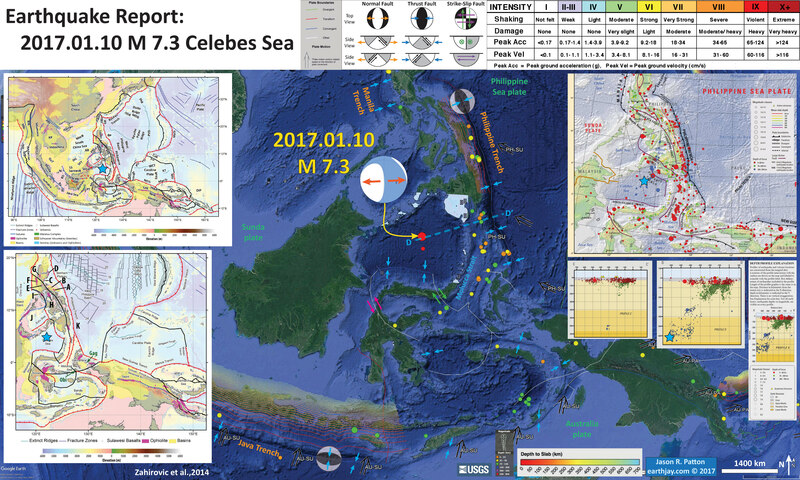 Below the map are two cross-sections (with a legend), C-C’ and D-D.’ Cross section D-D’ is aligned close to where this M 7.3 earthquake occurred. I place a blue star on the map and cross section in the general location of this earthquake epicenter (map) and hypocenter (cross section). On the left side of the poster I include a small scale (upper panel) and a large scale (bottom panel) view of the regional tectonics (Zahirovic et al., 2014). Plate boundary fault symbology (and other features, like fracture zones) is shown in the legend. I place a blue star on the map in the general location of this earthquake epicenter. This is the same poster, but includes earthquakes since 1900 with magnitudes M ≥ 6.5. Here are maps showing the regional tectonics (Zahirovic et al., 2014). Below I include the text from the original figure caption in blockquote. Regional tectonic setting of the Philippine Sea plate, Papua New Guinea and the Caroline Plate, following symbology of Fig. 1. The crystallization ages of ophiolites were used to infer oceanic crust age, while the metamorphic age was used to infer collision and obduction. A– Lagonoy Ophiolite, B – Calaguas Ophiolite, C – Dibut Bay Ophiolite, D– Casiguran Ophiolite, E – Montalban Ophiolite, F – Zambales– Angat Ophiolite, G– Itogon Ophiolite, H– Marinduque Basin/Sibuyan Ophiolite, I – Mindoro/Amnay ophiolites, J – Palawan Ophiolite, K– Pujada Ophiolite, PUB – Papuan Ultramafic Belt, COPB – central ophiolite belt. Here are plots showing the seismic tomographic results from Zahirovic et al. (2014). Basically, the authors use seismic waves in a 3-D geospatial model of the Earth to construct a 3-D model of the spatial variations in seismic velocity throughout the Earth. The concept is the same as that for 3-D Computed Tomography of X-Rays (aka CT-Scans). Their paper discusses a great many more details and they incorporate a broad range of methods in their analyses (including geologic history, topographic/bathymetric analyses, kinematic reconstructions (reconstructing plate motions over time), paleogeography, gravimetric analyses, and seismic tomography. The 2017.01.10 M 7.3 earthquake happened close to the cross section labeled G-G.’ Below I include the text from the original figure caption in blockquote. Here these authors present some seismic velocity contoured surfaces (isosurfaces). Basically, each of these blebs represents a 3-dimensional suface that is the same seismic velocity. These surfaces are imaginary (like elevation or topographic contours) because the seismic velocity actually varies in a more continuous manner (like elevation or topography). The color of the blebs is based on depth (see legend). 3-D visualization of +0.2% seismic velocity anomaly isosurfaces in MIT-P (top) and +0.9% seismic velocity perturbation in GyPSuM-S (bottom) models. Profiles A to G represent the vertical profiles (see Fig. 10) that capture the convergence and subduction histories of the region since the Cretaceous. Present-day coastlines are translucent grey shades, and present-day plate boundaries are translucent black lines. Slab volumes are colored by their depth, while the light blue color represents the interior surface of these slabs. PSCS – proto-South China Sea slab. Here the PSP is labelled as the blue slab “PSP” (colder blue slab = higher seismic velocity; warmer red mantle = lower seismic velocity). Vertical sections from MIT-P (Li et al., 2008) and GyPSuM-S (Simmons et al., 2009) seismic tomography models along profiles A to E (magenta lines). The first-order differences between the P- and S-wave models is that the amplitude of the positive seismic velocity anomalies significantly diminishes away from continental coverage (e.g., dashed lines in profiles A and B). A depth slice at 746 km from MIT-P is provided for reference with super-imposed present-day coastlines and plate boundaries. Interpreted slab sources are labeled: GI-BA= Greater India–Neo-Tethyan back-arc slab, M/N-T – Meso- and Neo-Tethyan slabs, W-S –Woyla–Sunda slabs, S – Sunda slab, PSCS – proto-South China Sea slab, PAC – Pacific slab, PMOL– proto-Molucca slab, PSOL – proto-Solomon slab, CS – Caroline slab, PSP – Philippine Sea Plate slab, S-C = Sulu–Celebes slab. Finally the authors present two models that incorporate the changes in plate boundary types and vergence through time (see panel with 2 maps an d2 cross-sections). 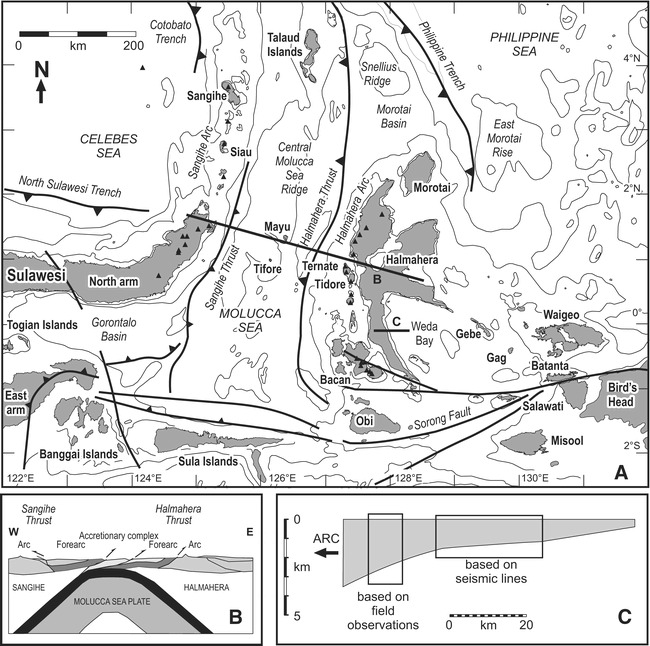 End-member pre-rift scenarios along northern Gondwana during the latest Jurassic (155 Ma) rift timing with a triple junction detaching the East Java, West Sulawesi, East Borneo and Mangkalihat from New Guinea driven by north-dipping subduction along the Woyla intra-oceanic arc representing the model implemented in this study (left). Alternatively, these blocks may have originated in the Argo Abyssal Plain (AAP), and a back-arc scenario may have existed along New Guinea (right), similar to the Incertus Arc proposed by Hall (2012). However, if this back-arc spreading did not detach continental blocks, then it may be the source for the proto-Philippine Arc. It is beyond the scope of this study to resolve whether the Mawgyi Nappes on West Burma or the Woyla Terranes on Sumatra contain microcontinental blocks, as it remains a continued source of controversy.We prefer the accretion of buoyant microcontinents in this region in order to account for the closure mechanism of theWoyla back arc in the Late Cretaceous. GAP – Gascoyne Abyssal Plain, PBE – proto-Banda Embayment, SNL– Sikuleh, Natal, Lolotoi and Bengkulu microcontinents. Schematic cross sections approximately follow dashed green line and are modified from Bouilhol et al. (2013). Not to scale. Here are maps showing the regional tectonics (Smoczyk et al., 2013). Along its western margin, the Philippine Sea plate is associated with a zone of oblique convergence with the Sunda plate. This highly active convergent plate boundary extends along both sides the Philippine Islands, from Luzon in the north to Sulawesi in the south. The tectonic setting of the Philippines is unusual in several respects: it is characterized by opposite-facing subduction systems on its east and west sides; the archipelago is cut by a major transform fault, the Philippine Fault; and the arc complex itself is marked by volcanism, faulting, and high seismic activity. Subduction of the Philippine Sea plate occurs at the eastern margin of the archipelago along the Philippine Trench and its northern extension, the East Luzon Trough. The East Luzon Trough is thought to be an unusual example of a subduction zone in the process of formation, as the Philippine Trench system gradually extends northward (Hamburger and others, 1983). This shows Global Positioning System (GPS) velocities at various locations. These plate motions are represented as vectors in mm/yr. (see legend) Here note how the vector labeled phil/eura (for the motion of the PSP relative to the Eurasia plate) is oblique to the plate margin along the Philippine trench (i.e. the PSP is not subducting perpendicular to the megathrust fault). The oblique relative motion seems to lead to strain partitioning, leading to a forearc sliver fault (the Philippine fault, shown in maps above). Below I include the text from the original figure caption in blockquote. Here is a map and cross section presented by Waltham et al. (2008). They use a variety of data sources as a basis for their interpretations (seismic reflection data, gravity data). Note how the Molucca Sea plate subducts both to the west and to the east. Below I include the text from the original figure caption in blockquote. Early work done in the region was presented by McCaffrey et al. (1980). Here is a map showing seismic refraction lines that they used to constrain the structures in this region. Below I include the text from the original figure caption in blockquote. Map of the Molucca Sea, eastern Indonesia, showing I~tions of seismic refraction lines (solid straight lines) and gravity traverses (duhed-dotted lines). Thrust faults are shown with teeth on hanging wall. Triangles represent active volcanoes defining the Sangihe and Halmahera magmatic arcs. Isobath interval is 1 km from Mammericks et al. . Here is a cross section that shows the gravity model they used to interpret this region. Gravity model for the central Molucca Sea. (II) Crustal model with layers designated by their density contrasts and refraction control points by open circles and vertical bars. (b) Mantle structure used in modeling the gravity profiles in the central Molucca Sea. Figure 124 fits into the small box at the apex of the inverted-V-ehaped lithosphere. Slab dimensions are controlled by earthquake foci (dots) from Hlltherton 11M Dickinaon [1969J, and mantle densities are taken from Grow 11M Rowin [1975J. The column at the left shows assumed densities for the range of depths between the tick marks. The small v pattern represents oceanic crust, and island arc crust is designated by a short parallel line pattern. East is to the right of the figure. 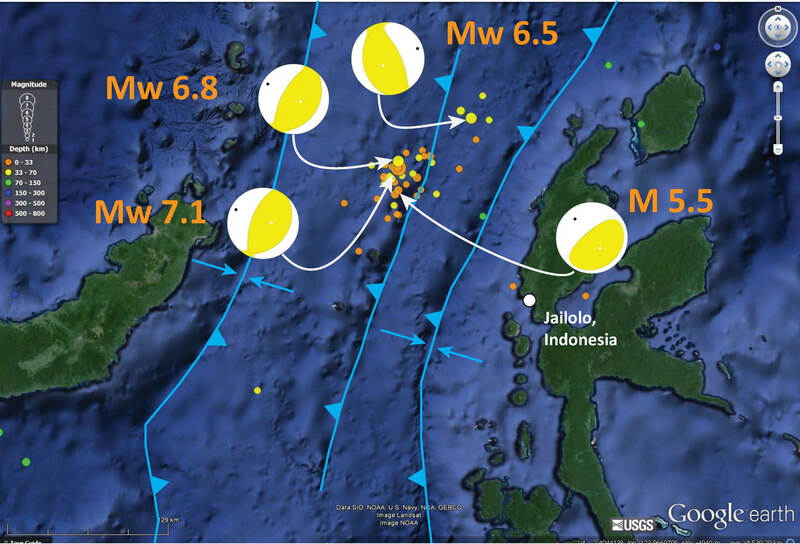 Here is a map with moment tensors plotted for four earthquakes that happened in the Molucca Strait in 2014. Note how they are east-west compressional. This earthquake happened really close to the M 7.1 from earlier (2014/11/15). Here is my page that has more information about the regional tectonic interpretations. Here is the USGS page for this M 6.8 earthquake.